Sports-Fitness-Solutions Newsletter, Issue #EXERCISE - WHAT'S IT DO FOR ME? EXERCISE - WHAT'S IT DO FOR ME? What’s exercise do for me in addition to getting me fit and helping me lose unwanted fat? Exercising and staying fit does a lot for you. In fact here’s a list of just some extra benefits of your fitness program that you may have never thought about. So the next time you feel like calling it a day when you’re working out, pull out this list and read about all of the great things exercising is doing for you; and it will hopefully motivate you to “stay the course”. Take a look at the following reasonS to exercise and let me know what you think. Exercise has been proven to reduce the risk of just about every single health problem known to man, from stroke to heart disease to cancer and osteoporosis. Exercise is also a great defense against type 2 diabetes, which is one of the fastest growing diseases of our time. Exercise firms your body, improves posture and even makes your skin glow. Looking your best is a super result of regular exercise. Anyone who exercises regularly will tell you that they are more energetic, feel less irritable and generally feel great. Exercise boosts energy levels, but also wears you out. It makes you feel great during the day and helps you to sleep better at night. Exercise is one of the most effective ways to fight aging. When you age your body loses muscle and bone; the losses of both are drastically reduced when you exercise regularly. In general, the best thing that you can do for back pain is to move and strengthen those muscles. Consult your physician or physical therapist for guidance; but in general exercise helps reduce and/or relieve back pain. Exercise has been proven to reduce depression, sometimes even as effectively as medication. People who exercise regularly generally feel good about themselves and the world around them. Improving your overall strength through exercise, and strengthening muscles around damaged joints helps to reduce joint pain and overall aches. Of course always consult your physician before starting an exercise program, especially if you have chronic joint pain. Exercise has been shown to improve memory and other cognitive functions; and has been shown to fight against dementia. A Harvard University researcher called exercise "Miracle-Grow for the brain." Whatever it is that you love in life (your kids, travel, sports, fashion) it is all more enjoyable when experienced in a fit and healthy body. Exercise so that you are able to enjoy all the great things in life. People who exercise regularly are 50% less likely to call in sick to work. A regular exercise program reduces colds and upper respiratory infections. In general you are more healthy than when you don’t exercise regularly. So what does regular exercise do for you? I hope you agree the answer is a lot. If you need help with a good exercise program feel free to contact me, I’ll be happy to help. As most of you know, I love fitness; and I hope I’ve shown you a few tangible reasons why a great exercise program is so important to all of us. So have fun exercising. Here is a muffin that is truly packed with fiber; and most important tastes great. 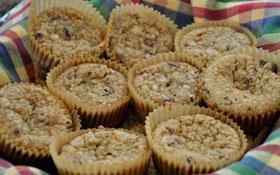 Whole wheat flour and wholesome cooked quinoa combine with almonds and cranberries for a moist and delicious treat. Try these warm with a good cup of coffee or tea. What a treat. 1. Preheat oven to 370 degrees F. Place 12 muffins liners in muffin pan and set aside. 2. In a medium sized bowl combine the rice milk, flaxseed, oil, maple syrup, vanilla, almond and lemon zest. 3. In a separate bowl combine the flour, ground almond, baking powder, salt, cinnamon and cardamom. Mix the dry ingredients with the wet ones and fold in the cooked quinoa and chopped cranberries. 4. Use an ice cream scooper to fill each muffin liner 3/4 full. Sprinkle the turbinado raw cane sugar on top of each muffin. One serving equals: 55 calories, 2.5g fat, 8g carbohydrate, 1g fiber, and 1g protein.